We’ve all been there: You think you’ve done your best to drink water and pace your drinks, but the night gets away from you and the morning feels like hell. We’ve got you. Here are 10 foods and drinks to get in your body ASAP when you’re hungover. A hangover is a notorious condition caused by drinking to excess. Hangover symptoms can range from a splitting headache and a queasy stomach to dry mouth, dizziness, lethargy, dry heaving and even depression. You feel super-sick, drained of energy and foggy-headed. Any food or drink (we don’t recommend more alcohol, though some swear by a hair of the dog!) will replenish nutrients and rehydrate you, especially if you happened to throw up. Here are some things that help cure a hangover in a hurry. That foggy-headed feeling can be relieved by staying well hydrated; excessive drinking causes dehyration. In addition to drinking water along with your alcoholic beverages, be sure to drink a glass of water as soon as you wake up. If you feel like your stomach can’t handle any food or mass amounts of water right away, then try sipping a sports drink. Not only will it rehydrate you, but it will also replenish your electrolytes, which can be depleted thanks to alcohol’s diuretic properties. Just try to choose a low-sugar option. 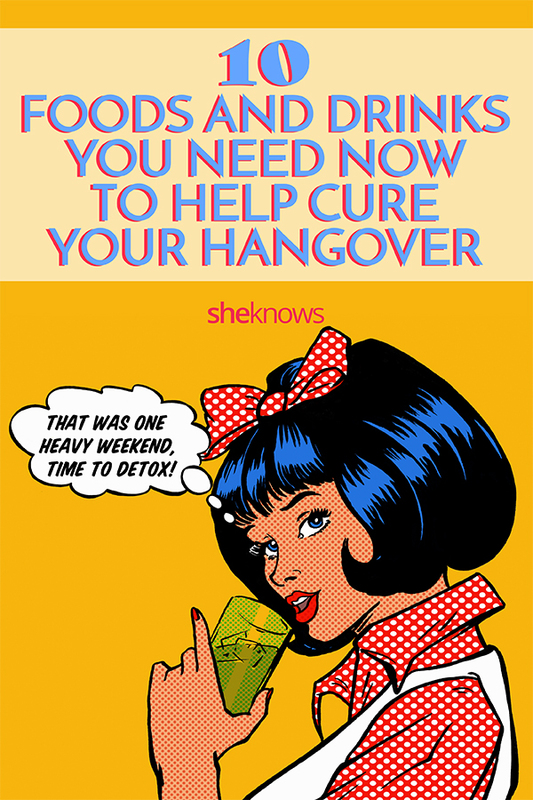 Is nausea your big hangover problem? If so, cracking open a can of seltzer or soda could do the trick. A caffeine-free option like ginger ale works especially well — without caffeine (a diuretic), you’ll rehydrate faster, and ginger has been used for centuries to settle upset stomachs. Due to alcohol’s diuretic effect, noshing on bananas the morning after can replace potassium and other lost electrolytes. Blend a banana into a fruit smoothie if your stomach is feeling rebellious against solid foods. You can combat the hangover fatigue by eating a light breakfast. The combination of protein and carbohydrates in an egg with toast is a good source of recovery nutrients as well as easy on the stomach. In addition, eggs contain the amino acid cysteine, which can break down the toxins that cause hangover symptoms, and whole grains contain magnesium, which alcohol can deplete. An herbal approach can also offer relief. Willow bark is nature’s answer to aspirin, while evening primrose oil can help nurse your alcohol-riddled liver back to health. Dosing with milk thistle oil or chewing fennel seeds is another aid in liver function. Herbal teas can help with rehydration, particularly peppermint tea, which will soothe your tummy. 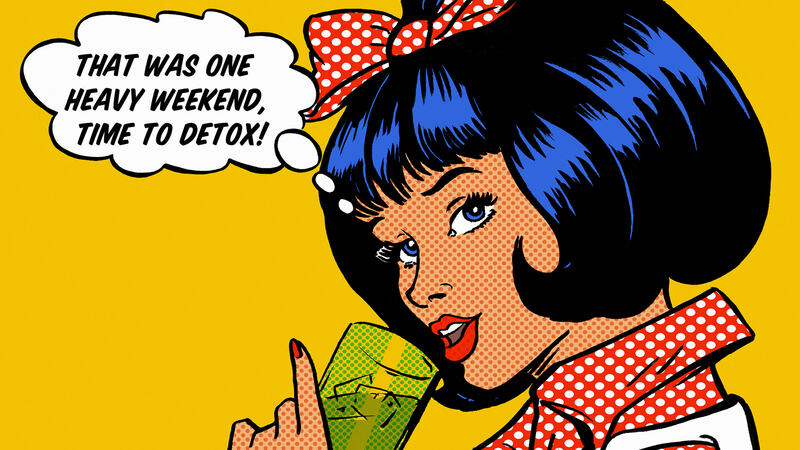 Talk to an herbalist or naturopath for the best herbal hangover prescription. Though a plate piled high with greasy pizza or a burger and fries might give you the dry heaves the morning after too much alcohol, eating high-fat foods before imbibing can reduce your risk of a hangover, because the fats line your stomach and intestines. A healthier approach is to eat foods high in healthy fats, such as olive oil, salmon or avocados, and keeping your alcoholic drinks to a minimum. A lot of people swear by spicy foods as a hangover cure. They jump-start your metabolism, and believe it or not, the spiciness itself gives you something to focus on other than how hungover you feel. But be careful: If you have trouble with spicy foods in general, then during a bad hangover is not the time to try them. If the thought of chewing is a little too much for you in your weary state, then a warm bowl of soup could be the perfect hangover cure. You can try a low-sodium option from a can or box, but it’s also simple to make your own. Heat up some low-sodium broth, add whatever veggies you have on hand (and some noodles if you’re feeling adventurous), and cook until they’re soft. The broth will rehydrate you, while the veggies will replenish the nutrients you lost the night before. Low-salt, low-fat crackers can be a godsend if your stomach is too queasy to keep down a big breakfast. Nibble on a few plain crackers to help soak up whatever nastiness is left in your stomach from last night, and after eating a few, you should start to feel better. A version of this article was originally published in October 2012.